While the travellers Miroslav Zikmund and Jiří Hanzelka map the most exotic parts of the world, back home Czech women discover the advantages of the Remoska electric cooker, and children are introduced to a new cartoon character, the Little Mole. At the Expo in Brussels, visitors from around the world queue for pork, dumplings and sauerkraut, served on porcelain designed by Jaroslav Ježek. The war rages and the first Czechoslovak flying squadrons are formed in England. 1941 Otto Wichterle invents the first Czech man-made fibre, silon. 1945 The war ends, the animated film company Bratři v triku is founded, Josef Skupa opens his Spejbl and Hurvínek Theatre. 1946 The Prague Spring music festival and the Karlovy Vary film festival are launched; the latter is in fact held in Marianbad. 1947 Jiří Trnka makes an animated film, The Czech Year. The explorers Miroslav Zikmund and Jiří Hanzelka head for Africa in their Tatra 87V. 1948 The communists take over and introduce censorship. Emil Zátopek begins his illustrious career in sport. 1950 The execution of Milada Horáková marks the start of a series of horrific political trials. 1953 A monument to Stalin is erected at Letná in Prague, the first Czech LPs are launched on the market. Currency reform turns people into beggars. 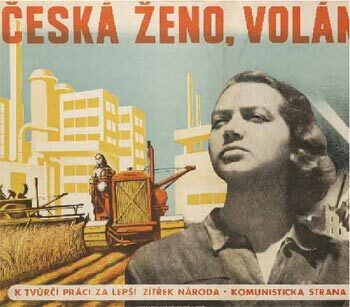 1954 The town Poruba is built in the spirit of socialist realism. 1955 Karel Zeman creates a sensation with his Journey to the Beginning of Time. Czechs train for the first Spartakiada mass synchronised gymnastics display, television broadcasts five days a week, steamships cruise on Lake Slapy..
1956 Scientists construct SAPO, the first Czech computer. Antonín Tenzer builds the Hotel Yalta on Wenceslas Square. The first birth-control advice centre is opened, as is the Tuzex chain, selling imported goods. The first nuclear reactor is brought into service. The Remoska electric cooker is launched on the market. 1958 The first Czech transistor radio, the T-58, is made. At the Brussels Expo, Czechoslovakia achieves phenomenal success with the film The Fabulous World of Jules Verne, the Laterna magika theatre, Josef Svoboda’s ‘polyekran’ multi-screen system, and the Czechoslovak restaurant. 1959 Josef Heyrovský wins the Nobel Prize for Chemistry. The Housing and Clothing Institute oversees the aesthetic quality of consumer goods. The Semafor Theatre opens.